The thyroid gland is situated in the neck and secretes thyroxine which is very essential for all organ function. Thyroid disorders are common in women and it is of two types: Functional – Hypo (reduced function) and Hyperthyroidism (excess of thyroid hormone). Hypothyroidism can be managed by thyroxine tab, generally 100 microgram taken with bed coffee. The hyper function generally can be treated with anti-thyroid drugs. 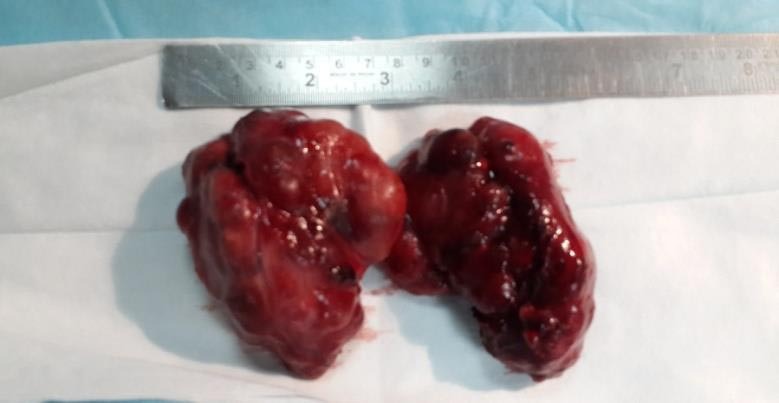 If it is not getting controlled with drugs or if associated thyroid enlargement is there, one has to resort to thyroid gland removal (thyroidectomy). Thyroid can enlarge during menarche (starting of menstrual cycle) and pregnancy which is called as physiological goiter, which will subside once the extra demand is over. Swelling (nodule) formation is a common problem. The nodule can be cancerous or noncancerous (benign). Thyroid tumours are common in women and they would like to have treatment options with a definite cosmetic appeal. Generally when someone is diagnosed with a single nodule or multiple nodules they need to be evaluated by ultrasound scan of neck and if needed fine needle aspiration cytology. The USG features or FNAC is suspicious of a malignancy then surgery is the solution, even at any size of the swelling. Even if the USG and FNAC suggest benign swelling the option of thyroidectomy needs to be sought if the nodule is more than 4 cm. Depending on the physical examination, USG and FNAC findings surgeon decides to offer a hemithyroidectomy (removal of full lobe on the side of lesion and isthmus) or total thyroidectomy. The lateral thyroidectomy by cutting on sides of neck for each side lobe removal – though better than full open surgery – is also not a desirable one. Robotic surgery does not give any advantage on the cosmetic aspect of the thyroid surgery. Endoscopic thyroidectomy – the keyhole or minimally invasive technique is a very good alternative to other methods. 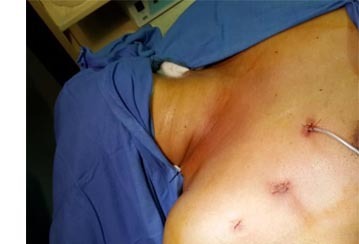 It gives excellent cosmetic outcome especially when done by an axillary approach. It gives equal or even a better surgical outcome as far as the actual thyroid nodule management is considered. There are other less preferred endoscopic approaches like sternal and breast approach. The procedure of endoscopic thyroidectomy by axillary approach involves the following steps. A 10-mm trocar placement in the axilla towards neck for the telescope; which initially helps in creating the plane and visualization of structures with magnification, precision and clarity. Then two 5-mm trocars are introduced in to the dissected space (subplatysmal) which are used as working ports. We use a less heat generating energy source the harmonic scalpel instead of cautery for tissue dissection. Once space is created in the neck, the sternomastoids and strap muscles gets exposed. We can open the investing layer in midline and reach the thyroid gland. The gland is mobilized by blunt dissection and vital structures identified. The recurrent laryngeal nerve (important for respiration) the superior laryngeal nerve (for voice) and parathyroids (for calcium metabolism) with their blood supply will be preserved. The blood vessels are divided and gland detached from trachea. A specimen bag is used to place the thyroid and removed by dilating 10 mm trocar. For a total thyoidectomy one will have to put additional trocars on the opposite side and do the same steps on that side as well. The investing layer is sutured back, drain is placed and the trocar sites closed. Patient is asked to be in the hospital for 24 hours only and can resume all kinds of activities in a few days. These patients will have less wound related problem compared to open surgery group. The cosmetic outcome is such excellent that the small wounds in axilla heals with minimal scarring and gets covered with small inner-wears. The earlier belief was that the endoscopic, no neck scar option for thyroid swellings are applicable to lesions of less than 4 cm size. But we have observed that swellings of size of even 12 – 15 cm can be tackled very successfully through this method. The only pre-requisite will be a surgeon with good experience, in both laparoscopic surgeries and thyroid surgeries. The complications of this surgery are very similar to that of open surgery proving that it is a much desirable option. Any kind of pathologies like benign or cancerous nodules, thyoiditis can be safely tackled by endoscopic thyroidectomy. 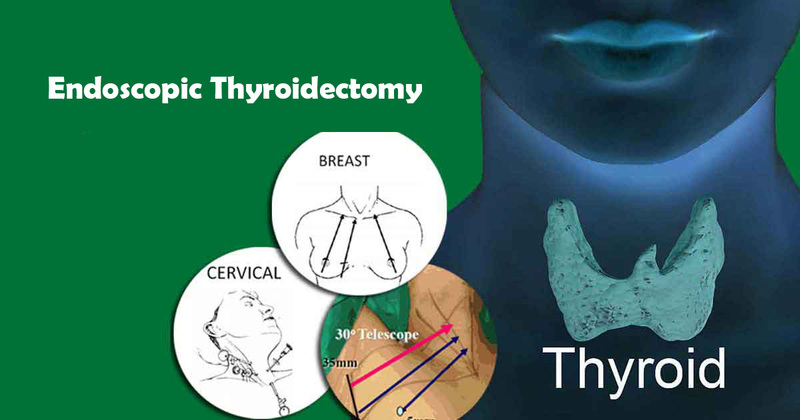 Completion of thyroidectomy is much more easier with this technique as one do not dissect the other side while performing the opposite side. 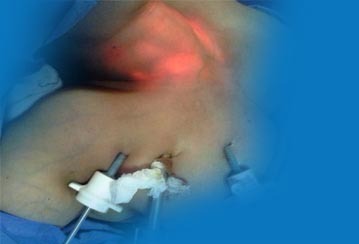 Lymph node clearance when indicated can also be comfortably performed by this route.